By Scott Gilfoid: Eddie Hearn says he’s given Matchroom Boxing stable fighter Dillian Whyte a “good offer” to challenge Anthony Joshua for his three major heavyweight world titles [IBF, WBA & WBO] on April 13, but he feels that ultimately Jarrell ‘Big Baby’ Miller is more “realistic” with he’s asking for with the money for the fight. Nevertheless, Hearn still places Miller (23-0-1, 20 KOs) at the end of the line at fourth place in who he wants for Joshua’s next fight. The order that Hearn is working on to get for Joshua’s April 13 fight is as follows: 1. Deontay 2. Fury 3. Whyte 4. Miller. If money wasn’t the overriding factor in the decision making in selecting Joshua’s next opponent, Wilder would have been selected a long time ago, but he wants a 50-50 split of the plunder for the April 13 fight. The same goes for Fury (27-0-1, 19 KOs). Fury wants half of the purse split for the fight with AJ, and Hearn doesn’t see him worth it. For his part, Whyte, 30, has got to feel pretty bad though, as he’s one of Hearn’s own Matchroom fighters, and he’s become a PPV guy in his own right. Whyte should be the one that is getting the Joshua fight in April based on what he’s done to earn the fight. Hearn isn’t saying what he offered Whyte, but it’s likely below the 60-40 that Fury and Wilder were offered. It’s a no brainer that Miller is the one that’ll accept the fight against Joshua, no matter what Hearn offers him, because he’s not on the same level as Wilder, Fury and Whyte in terms of accomplishments. Miller isn’t in the position to ask for a big money split against Joshua the way that Wilder, Fury and Whyte are. Hearn is just thinking of it as a money issue, which is why he may end up never matching Joshua against Fury and Wilder. Hearn failed to match Joshua against David Haye, even though that was a logical fight for him to make four years ago. Hearn didn’t make the fight. Haye ended up getting old, and his career imploded. Hearn didn’t match Joshua against Luis Ortiz, even though he had a chance to when the Cuban was briefly under his promotional wing. Ortiz proved himself worthy of a fight against Joshua during Hearn’s watch by beating Malik Scott and Dave Allen, and yet the Joshua-Ortiz fight still wasn’t made. Whyte would be the guy that Hearn would automatically stick in with Joshua for his April 13 fight at Wembley Stadium. Whyte is popular enough in the UK to help Joshua bring in a massive crowd for the 100,000 seat stadium in Wembley. Joshua-Whyte might not be a big enough fight to sellout the old stadium, but the fight would be big enough to attract 70,000+ boxing fans interested in seeing whether Joshua will lose for the first time in his six-year pro career. Joshua lost to Whyte in 2009 when the two of them were in the amateur ranks. That was before Whyte suffered a left shoulder injury, which ultimately hampered his efforts in the rematch with Joshua in 2015. If Whyte’s left shoulder is 100 percent, he has a good chance of knocking Joshua out, because he’s got a chin and stamina issues. 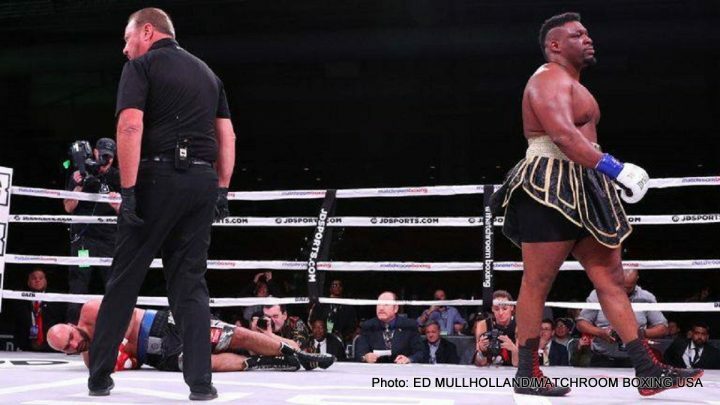 Whyte looked pretty poor though in his recent rematch against Dereck Chisora last December. Joshua will likely have no problems beating Whyte if he fights like that against him. This is a money thing though. Hearn wouldn’t be picking Whyte because of entertainment value. This is more about bringing in PPV buys and selling as many tickets as possible for the April 13 date at Wembley Stadium. “He wants a shot at the world heavyweight title. We’ve delivered that – he doesn’t feel like the package is right at the moment. I think it is a good offer,” Hearn said about Whyte. The way that Hearn is talking about Whyte, it doesn’t seem like he’s going to make any additional efforts to sweeten the deal to his liking. It’s too bad. Joshua vs. Whyte would be a heck of a lot better fight than Joshua-Miller. That’s a mismatch no matter how you want to spin it. The 315 pound Miller is a big, slow, light-hitting volume puncher. He’s perfect for Joshua to obliterate and look good in front of the casual boxing fans, who have no clue how flawed Miller is. It would be a showcase fight for Joshua. It would make him look better than he actually is, and have some boxing fans forgetting about how 41-year-old past his best Wladimir Klitschko had him on the canvas in 2017 and was on the verge of knocking him out. You have to wonder why Hearn keeps mentioning Wilder and Fury’s names in talking about Joshua’s next fight. It’s been clear for a while now that Fury will be facing Wilder again in a rematch, neither of those guys are going to be available to fight Joshua on April 13 or in June. For Hearn to be mentioning Wilder and Fury as possible opponents for Joshua’s next fight, it comes across to some as a ploy on his part. Hearn is either mentioning those two in to name drop to make sure the boxing fans don’t forget about Joshua, since he was forgotten last time Wilder and Fury fought, or he’s mentioning them so that he can get either Whyte or Miller to accept a lot less money. Hearn likely has one guy in mind for Joshua’s April 13 fight, and it’s either Whyte or Miller. It’s likely Whyte is the guy that Hearn wants. He’s the more popular fighter than Miller in the UK, and there’s more money to be made in a Joshua-Whyte fight than there is with a Joshua-Miller fight.